For the full range of Wild Apricot functionality, including the ability to design your website and set up events, you log into your Wild Apricot account from a browser. To download the Wild Apricot iOS app for administrators, tap here. The app is designed for the iPhone but is compatible with the iPad and iPod touch, and requires iOS version 8.0 or later. Wild Apricot's mobile app for administrators is not available for free accounts. Only full or read-only administrators, membership managers, event managers, or donation managers can log into the Wild Apricot app. After logging in, the options available to them will depend on their administrator permissions. For example, a membership manager will not see the Events tab. 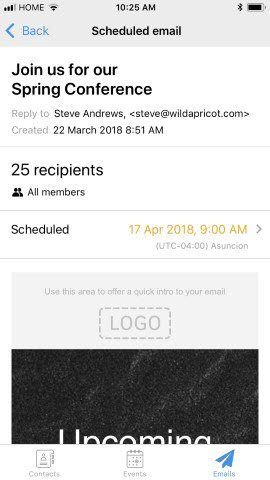 You can log into your Wild Apricot account using the email address associated with your Wild Apricot account, or using your Facebook credentials – assuming you are using the same email address for a Wild Apricot administrator account. If you are already logged into Facebook using the email address associated with your Wild Apricot site, tapping the Log in with Facebook button will automatically log you into your Wild Apricot account. When logging using your email address, enter your email address and password, then tap the Log in button. Currently, you cannot restore your password from the Wild Apricot app. If you do not remember your password, go to the Login screen on the browser version of your Wild Apricot account and click the Forgot password link next to the Login button. On the page that appears, you can enter your email address to receive a reset password link via email. If you're not familiar with what the Wild Apricot mobile app can do, tap Learn more from the Login screen. If there are multiple Wild Apricot accounts associated with your email address and password, you will be asked – after logging in – to choose the organization you want to manage at the moment. You can switch to a different association later from the Account screen. The Wild Apricot app consists of a number of modules: Contacts, Events, Emails, Account, and Help. To jump between the Contacts, Events, and Email modules, tap the module name at the bottom of the screen. To access any of these modules, as well as other screens, tap the menu icon in the upper left corner, or swipe from left to right, then chose from the options that appear. Within the Contacts module, you view and manage members and other contacts. What can't you do with contacts? To jump to the Contacts module, tap Contacts at the bottom of the screen. The Contacts module groups your contacts by categories onto different tabs. From the General tab, you can view the contacts you've opened most recently, view all contacts, view all members, or view archived members. On the other tabs within the Contacts module, contacts are grouped by saved contact and member searches, membership levels, and member groups. At the top of the Contacts module, the total number of contacts is displayed. You can tap this number to display a list of all contacts, or you can swipe left to view the number of members, then the number of new members (those added over the last month). Tapping one of the contact categories will display the contacts grouped under that category. For each contact, their name, email, organization, and membership level is displayed. An orange chevron indicates that the contact is an administrator. A red notice will appear for any contact who has an outstanding financial or membership issue requiring attention – such as an outstanding invoice or a pending application requiring approval. To view all the details for a contact, tap their name within the list. Within the contact details, their profile, event registrations, and financial transactions appear on different tabs. Pictures fields are not currently displayed within the contact's profile. Empty fields are not displayed when viewing contact details. On the Events tab, you can tap an event registration to view or modify the event registration details. On the Finances tab, invoices and payments are listed. At the top of the Finances tab appears the contact's balance due or overpaid amount, and the number of open invoices. You can record a manual payment against one or more open invoices. Payments and settled invoices are displayed in gray. You cannot currently view the details of a payment or settled invoice. To search for contacts, tap within the search box on a contact list then enter a search string. After you tap the search button, the current list will be filtered by the search string. Any contact whose name, organization, or email address includes the search string will be displayed. To remove the search filter, tap Cancel. To modify the contact details for a member or other contact, tap Edit button from the tab containing the information you want to change. From the Profile tab, you can modify any of the contact field values, or membership details including level, status, and renewal due, and set administrative privileges. From the Events tab, you can tap an event registration to view or modify event registration details. Unpaid registration fees will appear in red. For more information, see Viewing and modifying a registration (below). On the Finances tab, you can tap Pay to record manual payments for outstanding invoices. For more information, see Paying an outstanding invoice (below). You can suspend a member or archive a contact by tapping the Suspend or Archive button at the very bottom of their Profile tab. Suspending a member will convert the member to a non-member contact. Archiving a contact will remove the contact from your regular contact lists. The archived contact will not receive automatic emails or email blasts, and will no longer count towards your database limit. When you archive a contact who is a member, their membership will be automatically suspended. Suspending or archiving a bundle administrator will automatically suspend or archive all the members in that bundle. After archiving a contact, you can restore the contact by tapping the Restore button at the top of their Profile tab. To restore the membership of a suspended member, tap the Resume button at the top of their Profile tab. To add a new member or other contact, tap the plus sign at the top of the main Contacts screen. On the New contact screen, you can enter contact details, and optionally, select a membership level. To create a new contact record, you need to complete one of the following fields: First name, Last name, Email, or Organization. If you assign a membership level that charges a fee and select a pending membership status, an invoice will be automatically generated. You can delete invoices only from the browser version of Wild Apricot. Where the membership status is pending – Pending - New, Pending - Renewal, or Pending - Level change – a button will appear, along with the pending membership details. Tapping this button will display a number of options, including the ability to approve or reject the pending membership. The options available depend on whether the membership fee has been paid (or is not required), and whether an invoice has been generated. If a contact has an unpaid balance, the amount will be appear in red beside their name in contact lists and event registration lists. Using the Wild Apricot app, you can record a manual payment toward the balance. You cannot apply a previously recorded unsettled payment to an outstanding invoice. You can delete invoices and payments only from the browser version of Wild Apricot. To record a payment towards an outstanding invoice, go to the Finance tab for the contact, then tap the Pay button beside the invoice you want to pay. To pay all outstanding invoices, tap the Pay option at the top of the screen. On the screen that appears, you can record a manual payment or tap the Online payment tab to accept an online payment. On the Manual payment tab, you can enter the amount of the payment, select a payment tender, enter a comment for the payer, and record any internal notes. Once you are finished recording the payment, tap Record payment. On the Online payment tab, you can enter the amount of the payment, along with any comments or internal notes, then tap the button for the payment system you want to use. If you have a Wild Apricot Payments account set up to work with your Wild Apricot site, you can tap the Use WA Payments button to process a credit card payment for this invoice using Wild Apricot Payments. If you have set up the Square POS app for use with Wild Apricot, you can tap the Use Square POS button to process a credit card payment using Sqaure. If you've installed the PayPal Here app on your mobile device, you can click the Use PayPal Here button to accept a credit card payment using PayPal. What can't you do within the Events module? To jump to the Events module, tap Events at the bottom of the screen. The Event module groups your events into a number of categories. In addition to the All events option, events are grouped into upcoming and past events, and by event tag. Tapping any of these event categories will display the events grouped under that category. For each event, the list displays its title, starting date, location, registration status, and the number of checked in registrants vs. total registrants. A green dot indicates that the event is open for registration. Red text will appear if the event is restricted to administrators, selected membership levels, or selected member groups. Past events are marked with a gray starting date. The next upcoming event with registration enabled appears at the top of the Events module. You can tap this event to view its details, or swipe left to scroll through all upcoming events with registration enabled. To search for events, tap the search icon from an event list then enter a search string. After you tap the search button, the current list will be filtered by the search string. Events whose title, description, location, or tag includes the search string will be displayed. To remove the search filter, tap Cancel. To view the details of an event, tap the event within the list. Event details include the name, location, and starting date of the event, the number of checked in registrants, the total number of registrants (including guests), the collected event fees, and the outstanding event fees. If you sent RSVP emails for a simple event, a summary of the responses will appear. To view the event description, tap the event title. To open or close the event for registration, click the button to the right of the registration status. The list of registrants appears on the Registrants tab. For each registrant, the list displays the name, organization, registration type, the name(s) or number of guests (depending on whether contact information or separate registrations are required for guests under this registration type), and their checked-in status. If the registration fee has not been fully paid, the outstanding balance will appear in red to the right of the registrant's name. To record payment of the outstanding balance, tap the registrant's name within the registration details. On the screen that appears, you can tap Pay to record the payment. You can filter the registrants list by tapping the All registrants dropdown and selecting a filter from the menu that appears. You can also jump to a filtered registrants list by tapping on the totals appearing the event details screen. To search for a registrant, tap the search icon at the top of the screen then enter a search string and tap the search button. To view the details of a particular event registration, tap the registrant's name within the list. The registration details include all information entered on the event registration form. If the registration fee has been paid, the phrase Fully paid will appear. If the fee is unpaid, the outstanding amount will be displayed in red. When you tap the outstanding amount within an event registration, you'll go to the Record payment screen where you can tap the Pay button and record a manual payment toward the registration fee. To modify the event registration details, tap Edit at the top of the registration details. You can then modify the information appearing on the event registration form. You cannot add, modify, or delete separate guest registrations, but you can change the number of guests if the registration type does not require contact information for guests. Once you have finished making your changes, tap Save. To delete an existing event registration, scroll to the bottom of the registration details and tap the Delete registration button. To add a new event registrant, tap the plus sign ( + ) at the top of the registrants list. You can register a new contact, or select an existing one. Next, you complete the event registration form and finalize the registration by tapping Save. 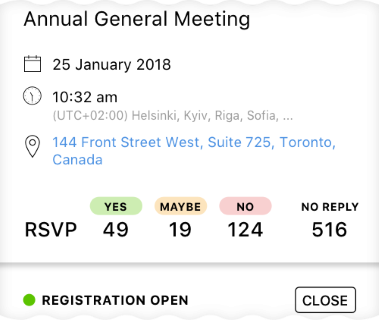 To check in a registrant – record their attendance at the event – you tap the open circle beside the registrant's name, within the registrants list or within the registration details. A check mark indicates that the registrant has been checked in. To undo a check in, tap the check mark beside the checked in registrant's name. If you are checking in a registrant who hasn't fully paid the registration fee, you will be asked whether you want to check in the registrant with or without payment. To check in a single guest, tap the open circle beside the name of the guest or the number of guests (depending on your guest registration settings). If there are multiple guests without contact or registration information under a particular registration, you tap the open circle then select the number of guests to be checked in. To email registrants for a particular event, go to the Event tab for the event, then tap the action button in the upper right corner and select the Email registrants option from the menu that appears. After choosing the recipients, you can compose the email then click the Send button in the upper right corner to send the message. Using this app, you cannot format the text of your email message. Once a waitlist is enabled for an event, a Waitlist tab will appear within the event details. Tapping the Waitlist tab will display a list of everyone on the waitlist for that event. You can tap on an individual entry within the waitlist to register that person or remove them from the waitlist. After tapping on the entry, click the menu button at the top and choose the appropriate option. ...or at the top of the events list. In either case, the New event screen will appear. From here, you can specify the following information. You must specify a title and a start date before you can save the event. (Required) The name of the event as it will appear to visitors on the event calendar and upcoming events gadgets. Location of the event. This will appear on event calendars and upcoming events gadgets. If you tap the yellow bar, the description will appear formatted with HTML code, which you can modify and save. Controls who can view this event on an event calendar or via a direct link. You can make this event public, restrict the visibility of the event by membership level, member groups, or limit access to administrators only. If you restrict access by both membership levels and membership groups, then members who belong to any of the selected levels or groups will be able to view the event. If you check the All levels or All groups option then all levels or groups – including any levels or groups added in the future – will be selected. The event's start date and time. The start date is required but the start time is optional. The date format is based on your organization settings. The event's end date and time. The date format is based on your organization settings. The end date is not displayed if it's the same as the start date. (Required) Name used to identify the registration type (e.g. Non-member or VIP seating). This will be displayed to the registrant when asked to choose the registration type. Controls whether the registration type is active and available. Controls whether this registration type is available to everyone, just certain membership levels, or to anyone with the registration code you specify. Using registration codes allows you to offer discount pricing to selected people. If guest registration is enabled, registrants can register guests at the same time that they submit their own registration. You can set a limit on the number of guests per registrant, and control whether to collect contact information for each guest, collect full registration information for each guest, or just ask for the total number of guests. Unless you choose to collect full registration information for each guest, you can charge a special guest price for the event. The overall registration limit for the event, and waitlist policy to be applied when the limit is reached. For more information on waitlist settings, click here. Labels used to categorize events. You can only choose from existing tags. You cannot add a new event tag from this app. 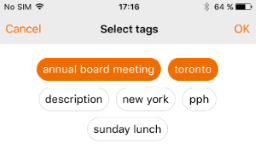 Selected tags will appear on the Select tags screen with an orange background. To select or deselect a tag, tap it. The overall limit on the total number of registrations for the event. After the event registration limit is reached, the registration will be closed and an email will be sent to the event organizer. On your event calendar page, visitors will see that the event is closed for registration, and that there are no spaces left. You can also set registration limits for individual registration types. Controls whether contacts can register multiple times for the same event. When multiple registrations are disabled at the event level, this option will not be available for individual registration types. The payment instructions that appear on the payment confirmation screen. You can create a new event by duplicating an existing one. To duplicate an existing event, open the event then tap the action button in the upper right corner and select the Duplicate option from the menu that appears. The new duplicate event will be saved as an admin-only event, and automatically opened for editing. The word (copy) will be appended to the name of the duplicate event to distinguish it from the original one. All event settings will be duplicated, except event access permissions, multiple sessions, and the list of registrants. Event email settings will also be duplicated but cannot be modified using the Wild Apricot app. To modify an existing event, open the event then tap the action button in the upper right corner and select the Edit option from the menu that appears. Tap the registration type within the Edit event screen. Scroll down to the bottom of the Edit registration type screen. Tap the Delete registration type button. Tap the OK button if you are sure you want to delete this registration type. You can delete an event if there are currently no registrants for the event. To delete an event, open the event then tap the action button in the upper right corner and select the Delete option from the menu that appears. You will be asked to confirm the deletion. Tap the OK button if you are sure you want to delete this event. Within the Emails module, you can view, send, and controlling the scheduling of emails. What can you do with emails? What can't you do with emails? To jump to the Emails module, tap Emails at the bottom of the screen. The Emails module organizes your emails onto 3 tabs: Drafts, Scheduled, and Sent. The Drafts tab displays unsent, unscheduled emails. The Scheduled tab displays unsent scheduled emails. The Sent tab displays a log of already sent manual emails. At first, the Emails module only displays emails created by you – the administrator who is currently logged into the app. ...so that the option is no longer green. Within the Emails module, the Drafts tab displays unscheduled email drafts. From here, you can view, send, and schedule email drafts. For each draft, the subject line of the email is displayed, along with the recipients and the date the draft was created. To view an email draft, tap it within the list. The details of your email draft will appear. Using this app, you cannot modify an email draft – its content or its recipients – but you can send it or schedule its delivery. You can use this app to schedule an email only if the email has a subject and one or more recipients already specified. To send the email draft immediately, tap Send at the top of the email details screen. You will be asked to confirm your request to send the email draft. To schedule the delivery of the draft, tap Schedule within the draft details. On the screen that appears, you can specify the date (and optionally, the time) you want the email to be delivered. The time you set here corresponds to your organization’s timezone. If you don't choose a time, it will default to 12:00 am on the specified day. The time you choose is when the email will be queued for delivery. The message may take anywhere from a few minutes to a few hours to be actually delivered. After you've indicated when you want the email delivered, tab the Schedule button. You will be asked to confirm your desire to automatically send the email as scheduled. Once you confirm its delivery schedule, the message will appear on the Scheduled tab within the Emails module. To unschedule a scheduled email, click the Cancel button on the schedule details screen. For more information on unscheduling a scheduled email, see below. On the Scheduled tab, you can view scheduled emails, and view or cancel the delivery schedule. For each scheduled email, the subject of the email is displayed, along with the recipients and the date the message is scheduled to be delivered. To view a scheduled email, tap the email within the list. The email details will appear. To view or cancel the delivery schedule, tap Scheduled within the email details. To cancel the scheduled delivery, tap the Cancel button on the screen that appears. You'll be asked to confirm your request to cancel the delivery schedule for this email. Once you confirm your request, the email will be moved to the Drafts tab. On the Sent tab, you can view a log of manual emails that have already been sent. You cannot use this app to view automatic emails that have already been sent. For each sent email, the subject of the email is displayed, along with the recipients and the delivery information (recipient or number of recipients, and percentage successfully delivered). To view the details of a sent email, tap it within the list. From the Settings screen, you can adjust settings for the app. Currently, you can control whether you are notified by the app when registration limits for an event are reached. The notification will appear in your device's Notification Center once a limit is reached either for a particular registration type or for the event itself. This option is only available only for full administrators and event managers, and only if you have enabled notifications for the app within your iOS device settings. When you first run the app, you will be asked whether you want to enable notifications. You can also enable notifications from your device's Notifications settings. From the Account module, you can log out of the app, switch to a different association, and change your account password. You can also tap your website URL to view the site in a browser. To jump to the Account module, slide left to right from any screen and tap the Account option that appears on the left. To log out of your Wild Apricot account, tap the Log out button from the Account screen. To switch to a different association, tap the Change association button then choose an association. To change your Wild Apricot account password, tap the Change password button from the Account screen. On the Set new password screen, you can enter and save a new password. If you can't find answers to your questions, you can contact our support department for assistance, free of charge. For contact options, slide left to right from any screen and tap the Contact us option that appears on the left. The Contact us screen displays links to contact us by phone or email, or to submit a support request. When you submit a support request, you provide details of your question or issue, which can lead to a faster response time.